This brand new "Eugenio" ring features an amazing cushion-cut pinkTourmaline gemstone surrounded by Diamonds set into our signature euro split-shank accented with hand engraving and filigree to create a memorable work of art. The "Eugenio" Collection is a collaboration between husband and wife, Vincent & Dallas. It began with one single ring that was designed by Vincent as an anniversary ring for Dallas and has now grown into a customer favorite. Each ring is designed as a one-of-a-kind home for the extraordinary exotic stones from our gem collection. We invite you to experience our vision of exceptional style and timeless distinction of our "Eugenio" Collection. The ring is cast in high polish 18k yellow gold with hand applied 18k white gold filigree at a finished weight of 16.0 grams. 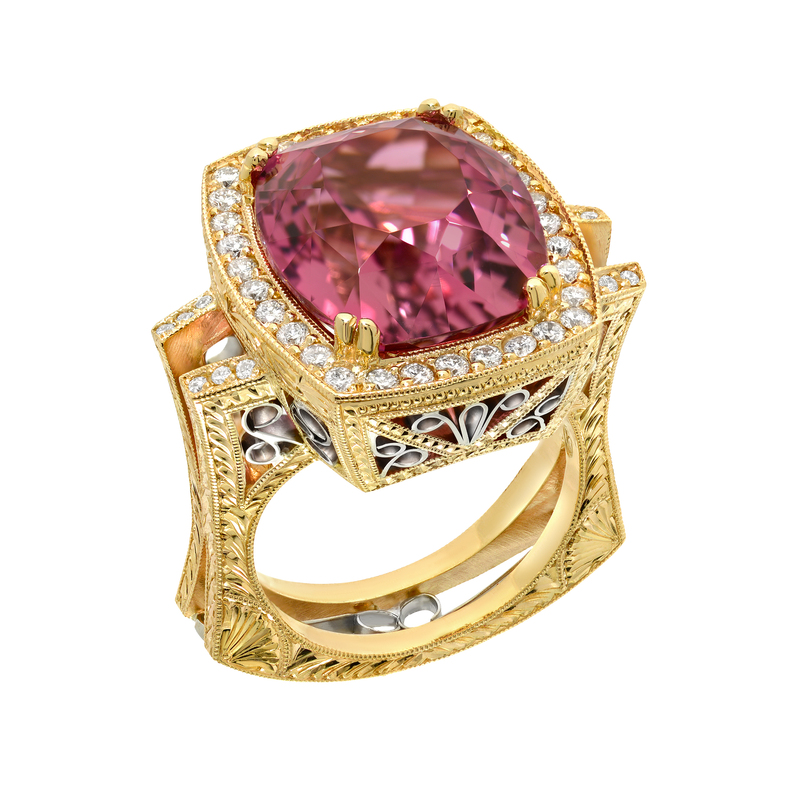 The center gemstone is a cushion-cut Tourmaline in an extraordinary pink-rose color weighing 14.36 carats. There is a prong set halo of round white diamonds, VS quality and G-H color, with a total weight of .68 carats. The most unique feature of this one-of-a-kind "Eugenio" ring is the fully hand engraved euro split shank with hand applied filigree through the center. The mounting is perfectly balanced and the "wearable" comfort will amaze you.